This morning I had the opportunity to catch the early 7:19 train and it certainly seems a much better option than the 8:45 train. The train was waiting at the station and left exactly at 7:19. The 7:19 is a extra train out of Framingham to handle the large number of early morning commuters that take the 506 train which leaves Worcester at 6:35. The conductor announced that they left Framingham a bit early because the train behind it ( 506 from Worcester) was already full. He also advised passengers to not put any personal items on the seats because they expect the train to be packed. When we pulled into Back Bay, I did see some double seats that only had one passenger. 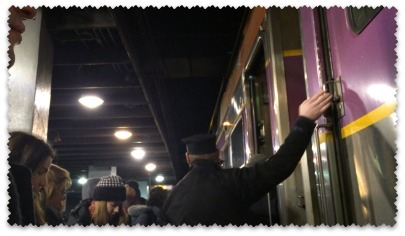 The train pulled into Back Bay around 8:26, leaving the ride to be more than an hour long to get into Boston. The train was late by about 10 minutes due to heavy ridership. After I arrived at Back bay, I got a text message that my regular train, the 514 @ 8:45 was delayed due to "train traffic ahead." Basically the heavy rider ship slow down causes the delay for the later trains. Keolis needs to fix the Worcester/Framingham schedule. Even if they don't add additional trains, they could at least put in more realistic times due to the large number of commuters. One solution would be making the 'extra' train a 7am train to minimize the train traffic delays. Worcester/Framingham users will have to wait till next Monday to see any improvements to the schedule since the MBTA changed the schedule for "Service Recovery" on February 18th. Filed under the "Framingham" and "MBTA" categories. [Permalink] - Comments are welcome on this post! For some odd reason the 508/514 train is cursed. It has not managed to arrive on time once in the past two weeks. To me this is a clear sign that the MBTA is still a long way from making the 100% schedule. Today the p514 was 15 minutes late. The MBTA had posted that the train was running about 30 mins late. I have heard that earlier trains are getting better. Later today we'll find out the schedule changes for next week, but I am not hopeful that there will be much improvement from this week. 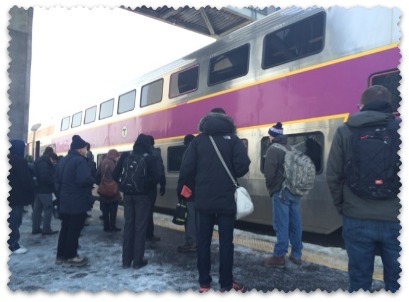 Yet another bad day commuting on the MBTA commuter rail, but there are some signs that progress is being made. Today's morning commute was only 15 minutes late and so far the evening commute has been on time. Boston Twitter users are still complaining about various delays on other lines, in particular trains that arrive at stations full and unable to pickup passengers. Framingham isn't out of the woods yet, but it does seem to fair better than other lines. The next couple of days I'll be working from home so I'll miss all the MBTA drama. I am hoping for better service on Friday. It was super cold this morning. I ended up going to Tedeschi Food Shopsand getting a 24oz coffee. It's the $1.85 that I'll probably spend today. Really wasn't all that bad and more importantly it kept me warm. I certainly would go here again because of the location, since if by chance the train was to come early I could hear it. I needed it since it was -10 this morning and the train was running a bit late. 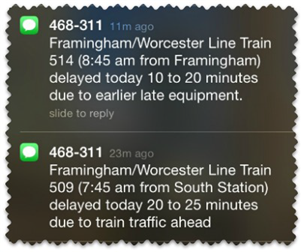 The P515 train left Framingham at 9:18am about a 1/2 hour late. There were a lot more people at the station than in the past few days. Surprisingly not many bailed out once the announcement that the train was running late. One of the things that made this morning's commute a bit better was the extra train that ran during the 7 o'clock hour. I don't know where Keolis found the extra train but it would be great if the can use it for this evening's commute. There's some talk in the media about some type of refund for February's monthly pass holders. Clearly some message got across to the train conductors because this morning they didn't even check for tickets when they had plenty of time to do so. This morning's commute wasn't great for the Worcester/Framingham line. The 6:35 train was running 45 mins late and the 7:00 train never really made it out of Worcester to be rush hour train. Thus leaving only two trains for today's rush hour. Not good at all. While waiting for the 8:45 (P514) train out of Framingham, several people told me how they had to work from home this pass week because of the serious train delays. The MBTA was going to use the same schedule this week. It took 45 minutes to get from Framingham to Back bay this morning. The biggest surprise of the morning was that there weren't as many commuters in the Wellesley stops. I was surprised because the earlier train couldn't pick up any passengers and yet we only picked up 20 passengers in Wellesley Hills. Where did the commuters go? This evening commute wasn't any better. I arrived at the train station hoping to catch the late 5pm (P527) train. I missed the train because they couldn't get any more passengers in the train. The next train arrived about 10 minutes later and I was fortunate to get a seat. It wasn't as crowded as the 5pm train, but there were about 20 people standing in the car I was in. The train moved slower than normal because of the earlier train. The combination delays resulted in me getting home an hour later than usual. It's a really good thing that I don't have daycare pickup duties, because I would never make it to the center on time. I took the 7:15 train from Framingham and it was about 15 minutes late. Which is was good, because frost bite kicks in about 30 minutes. Unfortunately, there is no warm place to stay while waiting for the train. Some early arrivals did have some close parking spots and were able to wait in their cars for the train. Some people also try to keep warm in the elevator. In 2009, the MBTA invested in a train notification infrastructure that would alert commuters on how long they would have to wait for the train. This replaced a refunding program where if the trains were running 15 minutes late, you could get a refund for your ride. Can you imagine what it would have happened if it was still in effect? That train notification system made a big difference this morning because we knew how long we would have to wait for the train. If it was going to be longer than 20 minutes I might have gotten a coffee at a near by Tedeschi Food Shop. There are still many stairs on the train that have lots of snow on them from last weekend's storm. While some of these doors don't get any use. However, if an emergency happened on the train and people had to exit, it would be very dangerous to have to go down some of those stairs. I think that Dunkin Donuts or Honey Dew should invest in some mobile stores for next winter. They certainly would have done well with the 50 or so people that were waiting for the train. Today the train situation was a bit better than yesterday as the trains were running only 15 minutes late. I was concern of more delays today because 3 inches of snow fell overnight. One sign that it was going to be a better day, was their were fewer delays from earlier trains. 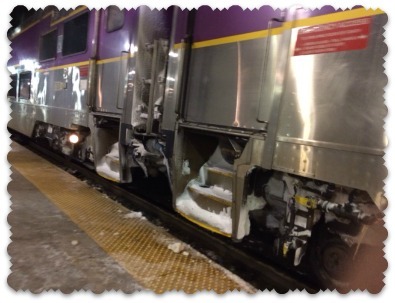 In the past few days, critical issues such as frozen doors would delay many early commuter rail trains. Things do look positive today. The commuter platform wasn't shoveled this morning which was funny since the MBTA was paying people $30 an hour to shovel on Monday. A bunch of us waiting for the train was willing to shovel while waiting. As for yesterday debacle, one rider told me that he didn't get to work until 11 am. This makes his morning commute almost 3 1/2 hours. Yikes! The parking lot was the same situation it was yesterday, lots of available parking. I am hoping that this afternoon commute goes smoothly and that the MBTA is implementing a better Winter strategy. Today I ventured out to catch the 8:45am (P514) MBTA Commuter rail train from Framingham to Boston. I avoided taking the train yesterday because I kept getting text messages about delays from earlier trains. I figured the delays would trickle down to later trains, and I was right. I heard from several commuters, via Twitter, that they had a bad commute since one of the trains that arrived at the Framingham station was completely full and about 100 people were not able to get on. 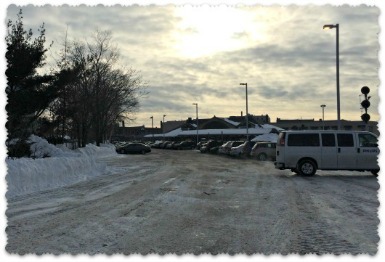 The first thing I noticed when I arrived at the train station was a large number of available parking spaces in the public MBTA commuter lot. On any given Wednesday, the parking lot would be almost full. I was able to count at least 20 spots available. This to me indicated that a lot of people have giving up on the commuter rail. Commuters may have decided to drive into the city or work from home. Based on traffic reports from WBZ, it seems that a lot of commuters have decided to drive into the city. The P514 train kept getting delayed and after waiting for 20 minutes I decided to bail out. About 40% of those that were waiting also decided to leave. Many of us didn't made sense to wait for an hour for the train and then have to endure the slow train ride into the city. Oh, and we were thinking - What would the evening commute be like? Incidentally - The plow job at the Framingham Commuter rail lot was was done poorly as there are a lot of spaces that people can't park in because of the size of the snow piles. Laz Parking crew should double check how the lots are plowed and make adjustments to maximize the number of parking spots. After all, the more people that park in the lot, the more money they make. Let's see what happen's tomorrow. Based on the events on February 2015, I certainly would be interested in what was proposed in the plan. One of the mistakes that the MBTA made in today's winter schedule adjustment is not adding more time between stations. All the trains were running slow because of the snow conditions. I was surprised to even see my train still plowing snow as it arrived at the Framingham station since this was the 5th train of the morning. It appears that when the MBTA made the schedule change, they only took out the express trains. In the future, they should factor in speed adjustments between stations. In, addition, having fewer trains means that more commuters will be waiting to board the train. As a result, it means the train would be staying at the station longer. None of this was taken into consideration in today's schedule. 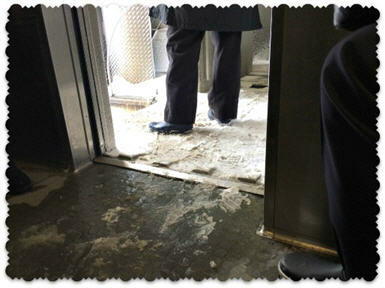 Another issue that I saw this morning was a lot of snow near the stairs as you get on the train. I saw a couple of commuters nearly slip because of the snow/ice near the stairs. The conductors should have the ability to remove the snow in between stops. On a positive note, it was good to see the MBTA using double deckers to handle the large number of commuters this morning. The trains were nice and warm too.